Today we bring you a new feature, called “What She Said…” in which we both review books that the other has already read and reviewed. The idea arose because of the dilemma that if one of us reads and reviews a book, the other can’t really post again about it, right? WRONG! Hence, “What She Said…” was born. For those books that we REALLY want to read after the other has reviewed – and gushed – about it. For today’s installment, we take on Jasmyn by Alex Bell, and The Demon’s Lexicon by Sarah Rees Brennan. “You know those books, the ones that when you finish them you feel like your heart is being twisted in your chest – with love for how wonderful the book was, but inexplicable sorrow too because the book has come to an end? 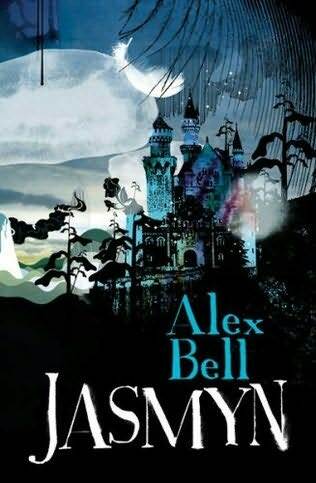 Such is Alex Bell’s beautiful, haunting contemporary fairy tale, Jasmyn. What Ana Says: Thea’s review of Jasmyn made me almost regret sending the book to her instead of reading it first: Jasmyn, the book, travelled all the way from the UK to LA and back before I was able to read it, almost an exact imitation of the journey that Jasmyn, the character, undertakes in the book. Starting in the UK, the 27 year old recently widowed albino woman tries to live through the grief of losing Liam, the man who was not only her husband, but her soul mate, her childhood sweetheart. Ever since that day, in primary school and he walked to her and instead of voicing the usual cruel taunt of “are you a ghost” he asked “are you a snow princess”, he has been her safe port, her best friend and Jasmyn is overtaken with loneliness when she loses him. Then strange things begin to happen , starting with black swans falling from the sky on the day of the funeral and her wedding photos, all of a sudden showing her face twisted in agony instead of the happiness she remembers feeling – to an around the world race for answers – about Liam and who he really was. Jasmyn is one of those books where the STORY itself outshines everything else and I simply loved reading this book – regardless of how I sometimes felt about Jasmyn and her lack of self-confidence. Regardless of the fact that I felt like punching Ben, Liam’s brother, in the face. Regardless that sometimes, the writing was tentative and the lack of detail about the background fairytale left me wishing for more. The fact remains, that from beginning to end I was completely captivated by Jasmyn’s story – it is everything a fairytale should be: difficult and sad sprinkled with bits of horror and heartache but with such beauty that was almost painful for me to read. 2) I cannot stress this enough: Don’t start this book unless you mean to finish it. As difficult as it may be especially with Jasmyn and Ben’s frustrating behaviour in parts, the pay off only comes when you read till the end – this is one of those books where the ending rewrites the whole story and it’s all the more poignant for that. “You have never heard a story quite like this one. I can hear you protesting already but, the fact is, it doesn’t matter how old you are, how many books you’ve read, how many things you’ve seen…this story will be new to you. Maybe it will even haunt you a little. Because what happened to me….well, I don’t think it’s even happened before. And what a story this is. If it isn’t clear enough: I totally loved this book as much as Thea did and wholeheartedly second her recommendation. The Demon’s Lexicon starts with this opening line and it’s a great beginning because it serves the book well. This line is significant in the way it shows how the “abnormal” coexists with the “normal” in this world. Right there and then, I am taken. And this feeling only increases as I read and every single time I had to put this book down, I felt its absence. Much like an umbilical cord between myself and it, there was a calling, something that connected me with to it; I kept thinking about it when I wasn’t reading, mostly theorising about the main character and what it all meant. I am in a way, a few days after reading The Demon’s Lexicon, still hooked in its characters, still thinking about them but mostly still overflowing with admiration for the author. For what she did, for what she dared, for how she constructed the characters, the world, but mostly for how she showed a wondrous dark world and amazing, wonderful feelings such as sensitivity, devotion, fondness and sacrifice through the eyes of a character that feels none of these very same feelings and who is, at every turn and all the time, conscious of this…lacking. Ana has been trying to get me to read The Demon’s Lexicon practically from the second she started the book. I’d received countless emails from Ana about the darkness of the main character, the compelling plot, the strong writing and the humor of the novel, and was instantly intrigued. So, when I picked up Ms. Brennan’s debut novel for myself, I had some pretty high expectations, given Ana’s enthusiastic endorsement – and I’m pretty happy to say that I really liked this book. Nick is a character that makes it hard for the reader to connect with – it is so very hard to feel sympathy for Nick but it is impossible NOT to feel for him. Ms. Brennan does a ballsy thing by writing a character that is angry, cold, distant and almost alien – but it’s impossible NOT to care for him. Even though he doesn’t ever think or say it specifically, we know that he feels protective of Alan because he loves him (at least, that’s my interpretation). Nick might not identify with our concepts of love, but much like Jeff Lindsay’s Dexter, I think that he subconsciously knows and feels this. Maybe not in the way that “normal” people feel love…but it’s there, and he expresses it in his own way. In short, I loved Nick. He’s a very different character from the norm, and being privy to his thoughts, reading how he interprets (or fails to interpret) the people around him is fabulously different and insightful. Most YA novels tend to take the perspective of the everygirl/everyboy and look at the scarier, different characters from the outside – but Ms. Brennan flips convention through the eyes of a very different anti-hero protagonist. I cannot stress enough how much I loved that Nick was not written as a badass with a heart of gold – NO ONE in this book is what they seem. Besides Nick, Alan is another character that surprises with hidden depth. It is Nick as a character, and then the bond of brotherhood between Nick and Alan that makes The Demon’s Lexicon such a fabulous read. My only problems with the book had to be the uneven start and some of the writing. In the early chapters especially, the odd descriptions of movements and repetitive details read very much like a debut author trying to write her debut novel – which isn’t really bad, and doubtless will improve in subsequent books (as it is, by the end of The Demon’s Lexicon, Ms. Brennan finds her voice and smoothly tells her story). My other quibble would be with some of the humor – Jamie’s jokes, endearing to Ana felt forced and awkwardly un-funny to me – and with a level of predictability with the plot. There are many not-so-subtle hints strewn throughout The Demon’s Lexicon concerning The Twist – but to the book’s credit, even though you KNOW what’s coming from a mile away, it doesn’t really matter because the story is so dratted compelling! He was still speaking when the first shot was fired. Rating: 7 Very Good – and Ms. Brennan is clearly an author I need to keep my eye on in the future! What She Said: is a great column idea, by the way. 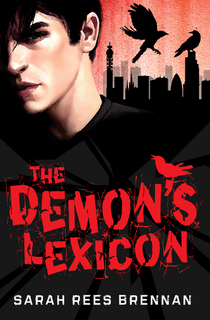 I’m reading The Demon’s Lexicon right now, and loving it! And I’ve been mad to read Jasmyn ever since I heard about it…must find a copy! Great feature/review! Hah, my TBR list is safe! These and The Name of the Wind are already on it. In fact, Jasmyn just came in the mail yesterday. So there! Yep, love the new feature. And this was a great one to start with as I want to read both of these! So thanks for the reviews. They’re both on my list. I also love the new feature! It’s fun to see what you both thought of a book. I just ordered the trade paperback from The Book Depository for $9.43 (US dollars). This site has free worldwide shipping. They also have the hardcover but it is a lot more expensive. Great thinking, Kristen! I ordered it from there as well… but found it for $10.66 (US dollars). What’s up with that? Of course I easily found three other books there that I had on my wish list, all at nearly 50%. I couldn’t resist. I also put Demon’s Lexicon on reserve at my library earlier today. Christine – We must have hit the site at the right time since I just checked again and it’s now $18 (only 10% off as opposed to the 54% off it was when I bought it earlier). Now I’m really glad I didn’t hesitate to purchase it (even if my husband did kind of look at me like I didn’t really need yet another book). Thanks everyone – I love the new feature as well. I get to read books and simply gush about them. And you girls are awesome! I am so glad you bought the book, now let’s see if you will like it as much as we did! Kristen – When I followed your link, the book came up $18, but I did a bit more searching and found it for the $10.66 at this link: http://www.bookdepository.com/book/9780575080294/Jasmyn . I’m not sure how they do their pricing, but I’m glad I found it for a reasonable price. Ana – Of course, I’ll let you know how much I enjoy Jasmyn when I get to it! I bought The Demon’s Lexicon after Ana’s review. I loved it. I’m still fascinated by the dichotomy between the way Nick is conveyed by the author – cold and unfeeling – and yet he is such an extremely compelling protagonist to read. I agree it’s very unique and ballsy. Rhiannon – I can understand that reaction; the writing definitely stumbled at times (feels like an author trying to write a debut novel at parts). BUT stick with it. I think by the end of the novel it’s worth it! 🙂 Just my opinion, of course!